natural beauty and archaeological history of Weedon Island. I’ve always been concerned that someone is going to miss out on an opportunity to learn about or experience something new. Old teacher habits never seem to fade away. If you have never explored, or been to Weedon Island in recent years, now is the perfect time to discover the cultural and environmental treasures in what is literally our own backyard. Weedon Island Preserve (www.weedonislandpreserve.org) is 3,700 acres of natural ecosystems easily located at 1800 Weedon Island Drive NE (go east on 83rd Avenue North until you see the signage for the turn). Both the Preserve and Cultural and Natural History Center receive 18,000 visitors a year. The Center emphasizes an art-inspired, hands-on educational approach to the area’s history and ecology. Hiking, paddling, fishing, and bird watching attract school groups and families, as do the frequent guest lecturers and education programs. Ecotourism has lured many foreign visitors. There is no admission, but donations are welcomed. Without individuals to volunteer at and support entities like Weedon Island, these community assets might not be able to continue. In 1992, a group of forward-thinking citizens formed the non-profit support organization, Friends of Weedon Island (www.fowi.org). The mission of this group is to preserve the Preserve through environmental and historical education and any other charitable purposes. FOWI provides volunteers, scholarships for summer camps and field trips, monetary support for lectures and lecturers, the purchase of education materials, a nesting environment for least terns, and most recently, has given $30,000 toward the restoration of an ancient wood canoe. The wood canoe was found buried in the muck on the Weedon coastline. This 1,100-year-old Manasota Culture 40-foot canoe is the longest ever found in a saltwater environment. Since 2011, it has been totally submerged in a custom designed vat of ever-changing liquids. Its last “bath” is polyethylene glycol, a wax-like substance to harden and preserve the fragile wood. The Alliance for Weedon Island Archaeological Research and Education (AWIARE) is overseeing this painstaking process at the Preserve. This artifact will be displayed in the Center as testimony to the trade, transportation, and fishing that went on a thousand years ago. Watch for an installation announcement. When FOWI ran out of viable, creative options for memorializing a loved one or a sponsorship supporting the mission of the organization, the members decided to commission a large artwork to celebrate the rich cultural and environmental history of Weedon Island. The art will provide recognition to its supporters, both living and deceased. 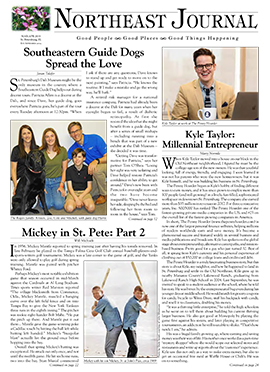 Since St. Petersburg has become a top arts destination, FOWI wanted a significant work that would also be an attraction destination in addition to what our local museums and galleries offer. 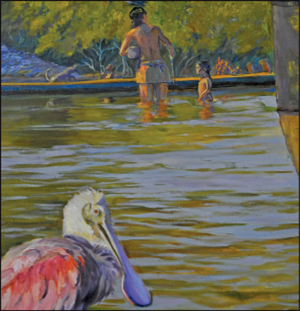 In Spring of 2013, FOWI commissioned local artist Carrie Jadus to create an oil painting approximately 6 x 8 feet, representing the natural beauty and archaeological history of Weedon Island. Carrie’s work is noted internationally in both galleries and private collections. She graduated from Pinellas County Center for the Arts, traveled and studied art in Europe, was awarded a Bachelor’s of Science in Electrical Engineering from USF, worked as an engineer… then, returned to her love: creating art. Carrie is recognized for her iconic Tampa Bay images, landscapes, portraits, and murals. 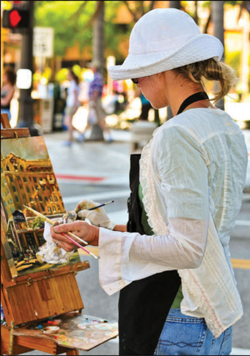 She designed commemorative posters for St. Petersburg Preservation and Downtown St. Pete’s Waterfront Parks Centennial. 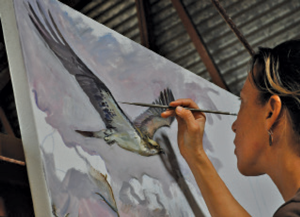 She maintains a studio in Soft Water Studio in the Warehouse Arts District. Carrie has remained steadfastly loyal to her vision. The completed painting will tell you a story and draw you into the surroundings. 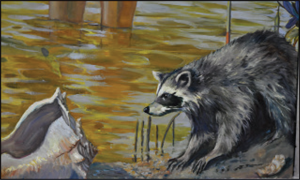 This painting, entitled “A Glimpse Through the Mangroves,” will help preserve the good works of FOWI for now and into the future of the Preserve. 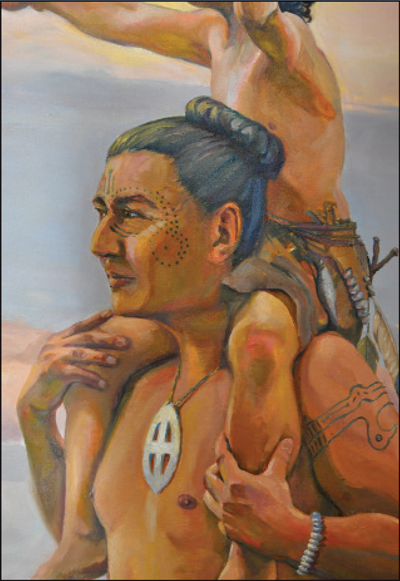 This is an artist’s rendition of what family life looked like for the Weedon Island Culture. The unveiling of this incredible painting will occur on Thursday evening, June 19, from 7-9pm in the Center. We will celebrate the art, artist and the history. We hope you will join us. If you would like to become a donor for this project, please go to fowi.org and click on “commemorative mural” for more information, including a PayPal option.